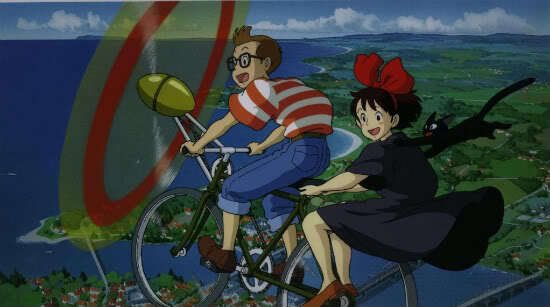 For my personal tastes, an afternoon of anime viewing doesn’t get much better than Kiki’s Delivery Service. I mean, seriously, a charming little witch wearing her purple-black dress and flying around a quaint seaside town making deliveries with her snarky and hilariously adorable black cat, Jiji — throw in an awkwardly geeky kid on a bicycle in hipster glasses and a red-striped tee reminiscent of Where’s Waldo, and combine it all with a hearty helping of lovable and kindly side characters in a don’t-you-wish-it-really-existed safe and innocent world — I think it all makes for one of the most charmingly wholesome little movies I know of. This is the only Ghibli film I can remember seeing commercials for as a child, so for me it has a special nostalgia apart from its inherent charms. I wish I’d seen the film as a child, even though being an “adult” hasn’t ever inhibited my enjoyment of childlike things. Kiki is also one of the best-known Ghilbli films among Americans, probably both because it did receive so much advertisement with its Disney release, and because Jiji the cat is such an iconic character.